Daily Illuminator: A Car Wars Hotspot . . . Or Just Plain Hot? April 16, 2014: A Car Wars Hotspot . . . Or Just Plain Hot? With more snow flurries inflicting themselves on parts of the country lately, you might find yourself saying, "Maybe we should go down south!" If you're living in the action-packed world of Car Wars and are willing to drive a vehicle fitted with armor and armaments, we at Warehouse 23 have you covered. AADA Road Atlas V3: The South is your guide to the perils and possibilities of Florida, Arkansas, South Carolina, and more. Learn what gangs are active where, how dangerous various cities are, and how to get from Point A to Point B with as little (or much!) trouble as you'd like. This digital reprint classic -- perfect for fans of Car Wars and GURPS Classic: Autoduel -- includes mini-adventures set in different states, campaign advice for autoduelling action in this area, and one complete tale set in sun-soaked central Florida. This digital edition also includes a combined map of the region for your plotting pleasure. 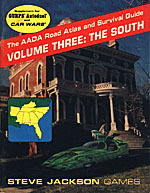 Whether you call the South home or are just hoping to pass through safely, AADA Road Atlas V3: The South has you covered!